HomeFab ForumThe albumsSgt PepperSgt Pepper rejected running order? Sgt Pepper rejected running order? One and one make one. Being slightly partial to "Lucy In The Sky With Diamonds ," I'd say their final choice was the right one! Interesting...I can imagine "She's Leaving Home" as a side-ender - it's got that air of finality ("Bye-bye..."), but that's the only other Side One track I'd want as a closer. Aside from that, I don't like that original sequence at all; they did make the right choice in changing it. Well, i like in away the official running order but with the exception of Lucy In The Sky With Diamonds which i would prefer to be in the B- side of the album and change position with "For The benefit Of Mr. Kite"
Not sure it would run as well with the rejected running order. As a show Mr Kite works far better bringing down the curtain on act 1. You can see the horses and acrobats leaping around the stage and after that the audience would need a break to recover their breath and marvel at the sights they had just seen. The only other rejected running order is Abbey Road where originally side 1 was side 2 and vice vera. I Want You was the album closer not The End (which would have closed side 1 - strangely). Not sure if Her Majesty was still in the medley or had been cut out and placed after The End tho. I Want You would've been a good album closer, but Abbey Road is perfect as is and it's a good closer to side one. Thinking about it, the beginning of With A Little Help would go really well into Being For The Benefit, so that'd be kind of nice, but it's a good song as a closer. The last few notes of She's Leaving Home would end a side pretty well. I still like the original better, but I really like this running order. Yeah, maybe With A Little Help would go well into your song (Mr. Kite), and I like She's Leaving Home , other than that, LEAVE IT!!! By hook or by crook, I'll be last in this book. I listened to Sgt Pepper the other day and started thinking about the running order on side two. As we all know, Good Morning Good Morning segues into Sgt Pepper (Reprise), which segues into A Day In The Life . Sgt Pepper (Reprise) was Neil Aspinall's idea, and was the last new song to be recorded for the album, on 1 April 1967. The final recording session was on 3 April (overdubs for Within You Without You ). After that there was a lot of mixing, and on 7 April the crossfades were made for Sgt Pepper into With A Little Help From My Friends , and Sgt Pepper (Reprise) into A Day In The Life . TL;DR: the reprise was a very late addition to the album. 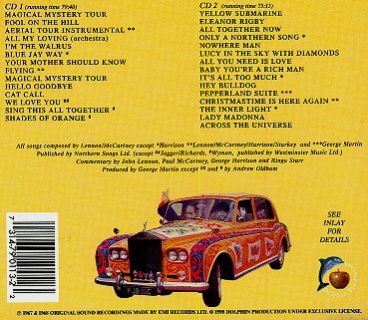 We can assume that A Day In The Life was always intended to be the closing song on Sgt Pepper . Let's also assume that Neil came up with the idea of Sgt Pepper (Reprise) shortly before it was written and recorded, sometime in late March. Now imagine how the album would have ended without the reprise of the title track. What were they planning before then? Good Morning Good Morning ends with the animals sound effects, culminating in the sound of a hunt, and farmyard ducks and geese. Were they intending to crossfade this into A Day In The Life , or would there have been a natural break between the songs? Could there even have been a different running order for side two? What they did though was better. They rarely wrong-footed themselves. While looking at my amazon home page, I noticed an alternate Sgt. Pepper in my "suggested items". So I searched google for "alternate Sgt. Pepper " and found a track listing. I burned a CD (including "Love In The Open Air" but excluding "Everywhere It's Christmas") I have to say, not too shabby. It has a really good flow. A splendid time is guaranteed for all. I had that very bootleg and there were multiple versions of some of the songs. It was a decent bootleg. Is that the one with the hilarious breakdown "announcement" on CD1? It's a strange collection that one. That's where I first came across Love In The Open Air. Can't remember @ewe2 tho their 'Alternate Submarine Tour' was a very odd collection of tracks too so more than likely. Sgt Pepper (Reprise) was Neil Aspinall's idea, and was the last new song to be recorded for the album, on 1 April 1967. I always thought the Reprise should have ended the LP, but A Day In The Life is the better choice, so maybe Reprise should have ended side 1. As I was considering what Sgt Pepper would sound like without the reprise, I decided that Lovely Rita would flow better into A Day In The Life than Good Morning Good Morning does. I therefore think the following tracklisting for side 2 would work best. This 8 track tape version was how I first heard it in my brother's 1969 Volkswagon Beetle (of course, lol) when I was eleven years old so it's my favorite running order. We listened to it on a long trip out of town so I got to experience the whole thing from start to finish.The Sgt Pepper reprise had an additional refrain to make it a bit longer so all four tracks could match up closely-- an important technical thing with 8 tracks. When I got home I bought the LP and was disappointed that the song order was way off from what I had heard. I grew to like the LP order but have a soft spot for that old 8 track order. Post 16 is still "awaiting moderation", @Ahhh Girl. not a bad running order actually, but it takes away some of my favourite transitions between songs. Not bad but I don't think I could listen to Pepper without Fixing A Hole and Good Morning Good Morning .